We have been considering many options when it comes to how we can incorporate glossary information into our Power BI reports. We have started the work of creating master data around our glossary and are considering how best to get it into our cubes. 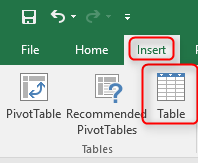 When Microsoft announced the tooltip pages for Power BI I saw that this could be the way we display the glossary in our reports. So, while we solve the problem of getting the glossary into the cubes I decided to try to add the glossary manually to a tooltip page to see how it looks. Traditionally we have been showing support measures in the tooltip. An example of this is when Net Sales Growth is in a graph the tooltip would show Net Sales and Net Sales Growth %. I really like how you can for most visuals put in multiple tooltip measures, but my problem has been that everything in the visual is displaying in the tooltip. For an example we sometimes include a measure only meant to colour the graph. This can be a Net Sales vs. EBTIDA measure or something like that. This measure is not meant for displaying in the graph but because you don‘t have any control over the tooltip it is displayed. With the tooltip page you have full control over what you display and what you don‘t and you get more space to work with. In the images below, you see that when looking at Gross Profit Growth in a graph we were displaying the Gross Profit and Gross Profit Growth and are using Gross Profit Growth % vs Net Sales Growth % to colour the graph. This is nice enough but the extra colouring measure is annoying and you are, in my mind, missing the definition of Gross Profit. Below you see an image of how we are now doing using the new tooltip pages. Here we are showing prior year Gross Profit, current period Gross Profit, the Gross Profit Growth % and the definition of Gross Profit. Now many of you might feel the definition is not important but when you work in a multinational company the definitions often become important. While the definition of Gross Profit is simple the definition of measures such as Cost of goods sold (COGS) can be complicated and so it‘s is important that everybody knows exactly what definition is used. This is of course just the start and I see plenty of opportunity to relay more messages to the users via the tooltip page. This can be definitions of calculations where appropriate or dimension definitions. This entry was posted in Uncategorized on March 30, 2018 by bidgeir. I had a rather odd experience this week. We are rolling Power BI out in the company I work for. We have a big investment in SSAS MD and that is not about to change. So I have been creating reports on top of SSAS MD for the last month or two with reasonable success. We are starting with a single cube and from the beginning number formatting was not recognized by Power BI. I assumed this was one of many things Power BI didn’t do well from SSAS MD so we tried to work our way around the problem. We used VBA functions in the cube script to limit measures to single decimal and we multiplied ratios by 100 to show percent. This was ok but not very good. Then we found a bad side effect with the VBA function which was that Excel pivot tables couldn’t recognize empty cells when using measures formatted with those functions. So I really starting looking into if Power BI couldn’t do number formatting from SSAS MD. It turns out that Power BI can do it but it just didn’t work for us. I tried few of our other cubes and while it didn’t work in the first couple cubes it did in some others. I got a tip from Koen Verbeeck (twitter) about an article by Chris Webb (twitter) (article) explaining that while Power BI did recognize number formatting from SSAS MD if you changed the number format in a scope sentence Power BI wouldn’t recognize it any more. I read the article but couldn’t link that to our problem as we didn’t change any number format in scope sentences and not only some of our measures were missing number formatting, but all of them. But the article got me thinking if our script could be the problem. We had quite few scope sentences in our script so I decided to start by deleting all scope sentences from the cube and see if Power BI recognized the number formatting then. And to my surprise it worked. I then decided to put them all in one by one to see where it went wrong. After some back and forth I managed to conclude that our time intelligence script (DateTool by SQLBI) and one other custom scope sentence (working on a dummy dimension) where to blame. Both these scripts were at the bottom of the script. What did the trick in the end was to take these two scripts and move them above the measures and all of a sudden Power BI recognizes the number formatting. I now have the task of removing all the extra measures from the cube and change all the reports to use the normal measures instead of the special measures we had created to go around the problem. 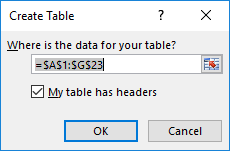 If you are using Power BI on top of SSAS MD and don’t get the number formatting through. Take a hard look at your scope sentences and see if you need to either change them or move them around in your script. This entry was posted in Uncategorized on May 26, 2017 by bidgeir. Now it’s one week since SQL Saturday Iceland 2017 finished and I’m almost recovered. It was a blast like last year but I enjoyed this one a bit more as I feel we were better prepared and knew more what we were facing. Before last year I had only attended SQL Saturdays as a speaker and an attendee and even though you feel you can sense some of the work that goes into the preparations you still don’t know until you do it. But it’s not only work and worries organizing a SQL Saturday. There is a lot of fun, new friends and learning to be had from it if you put in the effort. The organizing team had great fun together, I met a lot of lot of speakers, some for the first time others again and this experience of organizing such a big event will help me in my future endeavors. We had two pre-cons on the Friday which we had record attendees at. We also broke our record on the Saturday with just over 100 attendees. There was still 1/3 no shows so that’s something we need to work on. But I’m very pleased with how the event went. We had three tracks and the attendees were usually split nicely between those 3 tracks and everyone I met in the breaks were happy with what they saw and heard. We had 19 great speakers that took the journey to Iceland to speak and we are so appreciative of them. They are the key to this event being a success and their willingness to share their knowledge and time is so fantastic to such a small and isolated community as Iceland is. The venue was also great. All the equipment worked really well and the rooms were perfect for this size of an event. It didn’t hurt that you could see the snow falling in the un-spoilt nature through the big windows in the rooms. We also had great sponsors. Some were there for the first time while other have been with us from the start. It is fantastic to see such great backing for the SQL community and we are very thankful that our sponsors made this event possible. I really hope they got something out of it as well as we want this to be a win-win for all included. At last I just want to say thank you to the organizing team and other volunteers that worked hard both on the day but also during the weeks leading up to the event. I’m already looking forward to next year but before that I have some events to attend both as speaker and also as an attendee. More about that soon. This entry was posted in Uncategorized on March 25, 2017 by bidgeir. This entry was posted in Uncategorized on January 24, 2017 by bidgeir. Our procedure was to read the file into SQL Server and then manipulate it. 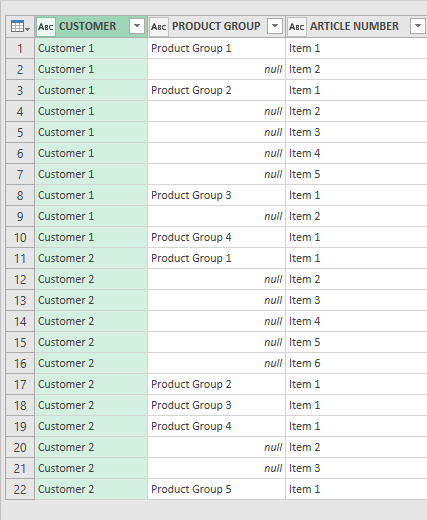 But in this case there was a problem with the empty rows in the Customer and Product Group columns. First instinct was to use native Excel to fill in the blanks. This can easily be done by either copying and pasting or by double clicking on the corner of a cell to copy its content down. The problem with that is that the file was thousands of rows of data and as you can see in this small sample above there are huge amount of cells to fill down. Excel also has something called Flash Fill but that didn’t work as we wanted. The next thing that came to mind was to write some VBA code to do it. This is probably easy for a skilled and experienced VBA developer but there was no such available. Then it came to me. Power Query / Power BI has a Fill transformation that fills either up or down in a column. So the problem was solved in 2 minutes. As I imagine this might be a common problem I decided to share my solution. 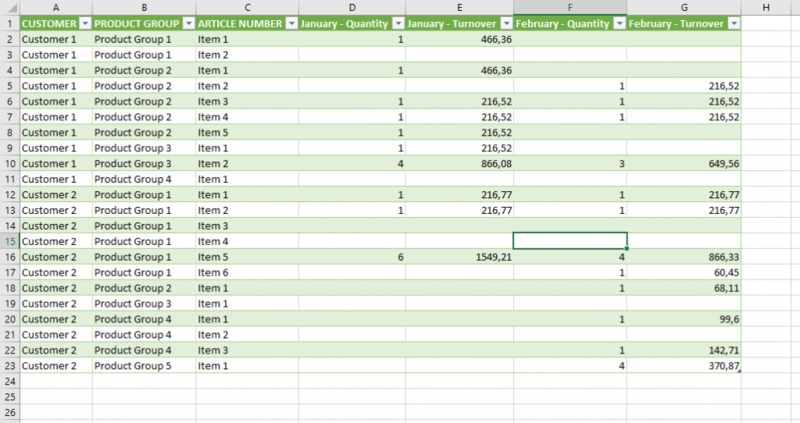 My solution is done in Excel 2016 but the same applies for Excel 2013. My data looked like below after I inserted the table. As you can see it looks like my table with null where there are empty values. Here is where Power Queries magic comes in. One of many built in transformation is the Fill transformation. You can find it by either right clicking on the header of a column or by placing the focus on the column you want to transform and use the Transform menu were you click the small down arrow next to Fill. 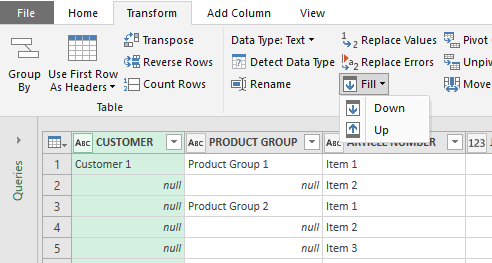 By pressing the Down option on the Fill menu Power Query fills values down to the next value overwriting only nulls. By repeating this for Product Group I get the following result which is exactly what I’m looking for. Now I just need to load this into Excel again by using the Close & Load on the Home menu. This automatically writes the results into a new Excel sheet. I love when there is a simple solution to a seemingly difficult problem and specially when I get to use something from my BI tool belt for something unexpected. This entry was posted in Uncategorized on January 6, 2017 by bidgeir. I’ve finally decided to start blogging. I have often thought about starting but never thought I had enough to say. Having traveled around a lot last year speaking at various SQL Saturdays and other events I realized that I have things to share and there are people out there that would like to read stuff about BI. So my intention for blogging in 2017 is at LEAST one blog a month. There might be more and they will be of different length and depth but I will at least put out one a month (and this doesn’t count). This entry was posted in Uncategorized on January 4, 2017 by bidgeir.